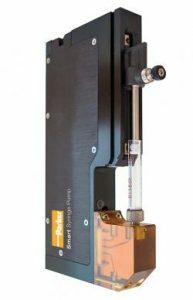 At one third the size and weight of standard 30mm syringe pumps, the Parker Smart Syringe Pump offers new opportunities to reduce size and improve performance of Clinical Diagnostic and Analytical chemistry systems requiring precision fluid delivery. This long life pump is designed to a minimum of 5 million cycles improving the reliability of laboratory instrumentation and reducing downtime. Its lightweight and compact design enables instrument designs that are smaller, reducing instrument costs and footprint.